From 4 October – 26 November 2017, the Pan African Space Station (PASS) broadcast LIVE from Museo Tamayo, Mexico City. Aeromoto, a public access library in Mexico City specialising in printed material on visual art and contemporary culture. Champeta Punk, a DJ collective based in Mexico City and Bogotá started in 2013 and focused on Champeta music. Cráter Invertido, an art, editorial and radio production collective based in Mexico City. Casa Hankili So Africa, an art centre for exiled African writers, artists and creators in the region. Diego Ibanez is a composer and radio producer based in Mexico. Eva Munyiri is a Kenyan filmmaker based in Mexico City. Lagartijas tiradas al sol, a performance collective led by Luisa Pardo and Gabino Rodríguez. Max Jorge Hinderer Cruz, a Bolivian-German philosopher, writer and editor based in Rio de Janeiro. Radio Ñuu Kaan, an interactive radio platform based in Santa Maria Jicaltepec, Oaxaca. 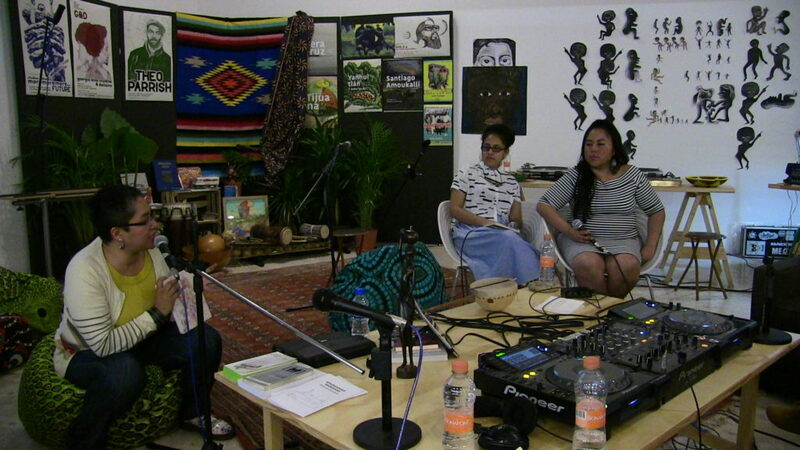 Radio Zapote, an interdisciplinary and collaborative radio platform based in Mexico City. Category: News, Pass Blog | Tags: Museo Tamayo, PASS in Mexico, PASS Pop-up | Bookmark: permalink.